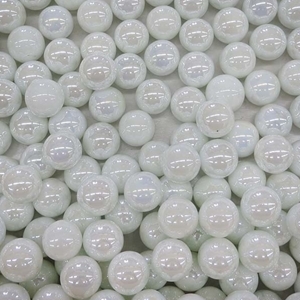 MoonMarble.com - White Pearl 9/16"
Bulk Marbles → Opaque Game Marbles, all sizes → Approx. 9/16" or 14mm → White Pearl 9/16"
These solid white marbles are iridized, which means they have an extra shiny reflective surface like the surface of oil. These marbles are sold in bulk quantities, individually or assorted with other colors. There are approximately 100- 120 marbles in a pound. They are also available in approximately 250 count. Note: These counts are approximate and not guaranteed amounts. Sizes and color may vary slightly. Warning! : Choking Hazard. This toy is a marble. Not recommended for children under 5 years.